The contemporary trends of IoT and advanced technology have left an inexorable impact on healthcare electronics market in recent times. Over last few decades, the role of electronic components, digital devices, and products has been continuously growing in the healthcare fraternity, which, in extension, played a crucial role in shaping healthcare electronics industry. Having come a long way since its inception, healthcare electronics industry now boasts of user-friendly and rather effective applications that were perpetually absent in the nascent stages of this business space. For instance, in the past, these components were huge, bulky, and intangible, and had limited functionality to offer, making it difficult for the doctors to use them. With robust developments in medical space though, the global healthcare electronics industry has today achieved unexpected heights of success. Thus, it wouldn’t be incorrect to say that the influx of medical electronics technology has significantly reinforced the existing healthcare infrastructure to modern day advancements right from digitizing diagnosis procedures & medical tests to enhancing the reach of healthcare through m-Health, telemedicine, and healthcare IT. Owing to the fast-paced growth in the technological domain, healthcare electronics market has witnessed a remarkable double-digit growth rate in the recent years. Experts claim this growth trajectory to remain consistent, subject to the rising prevalence of chronic diseases, growing elderly population and increased urbanization. A myriad range of verticals comprising electrocardiography, stethoscope, x-ray medical imaging, and semiconductors have witnessed a widespread inflow of high-grade technological upgrades, which played a key role in augmenting the growth of this business space. Alternatively, technological advancements in the healthcare sector have in turn presented significant growth opportunities for semiconductor industry players. Semiconductors being an integral part of myriad medical equipment ranging from small handheld to high-end imaging devices, it is quite overt that the role of semiconductor suppliers would become more and more pivotal as healthcare electronics market would be inclined toward the development of more compact and portable devices. The rising preferences for home-based healthcare have further lead to the development of next-generation monitoring and testing equipment. For instance, Fujifilm, a leading global supplier of thin film chemicals, polyimides, photoresists, and cleaners for the semiconductor industry has recently introduced ELUXEO, an advanced endoscopic video imaging system to its product portfolio. This advanced endoscopic video imaging processor features 4 LED multi-light technology to enhance the visualization of area in the gastrointestinal tract. Such advancements endowed with better functionality have created escalating demand for the medical products, in turn stimulating healthcare electronics industry to carve out a profitable roadmap in the ensuing years. It is prudent to mention that North America is quite a lucrative hub for healthcare, owing to which healthcare electronics industry has substantially established its presence across the U.S., one of the most developed regions of the continent. 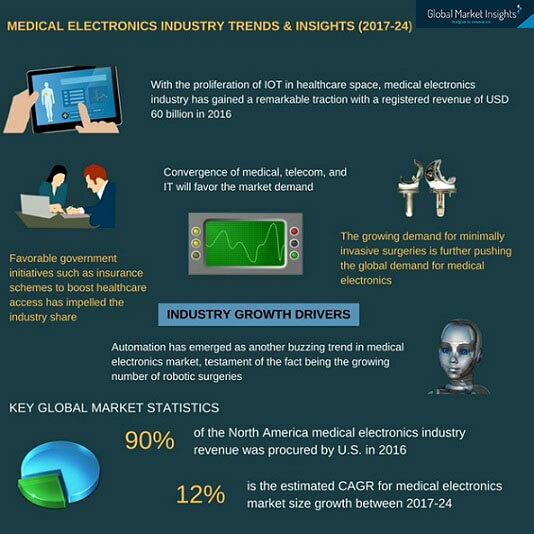 The presence of established industry players coupled with the launch of advanced technologies in the region have been the driving forces behind the growth of U.S. medical electronics market. In fact, reports claim the U.S. to have contributed to more than 90% toward North America healthcare electronics industry share in 2016. Ingestible medical devices, designed to effectively carry out real time monitoring of drugs and patient health have been the new breakthroughs in healthcare electronics industry. Despite the fact that ingestible digital medicine production is still in the developmental stages, edible electronics have hit the market sooner than anticipated. The battery powered swallowable cameras which are the size of a large pill have penetrated healthcare electronics market since 2001. Medtronic, a leading healthcare electronics industry player, introduced its first deep brain stimulator in 2002, to treat symptoms of Parkinson’s disease. Since then, several companies are leveraging on medical electronics technology to manufacture capsules that can be inserted into the esophagus, small intestine, and colon. The growing demand for non-invasive treatment has encouraged several scientists to explore medical electronics technology to brainstorm devices that can be swallowed and partially digested. With the advent of ingestible medical devices and swallowable pills, healthcare electronics industry is gaining immense traction in monitoring drug adherence, internal imaging, and even in delivering therapeutics. Speaking of the existing ingestible medical devices, the device - Proteus Personal Monitor had been approved by the FDA a few years back, as a novel method that could enable the clinicians to monitor real time adherence of long term drug therapy. Creating a new category of therapy in digital medicines, Proteus has also received a CE certification mark in Europe for its implantable and ingestible sensor devices. Digital medicine therapy, another significantly developing domain, has been receiving massive momentum of late, as it offers wearable sensors that capture physiologic response and helps deliver drugs that transfer signals when they’ve been ingested. Touted as a parent fraternity to healthcare electronics industry, digitized medicine therapy deploys data analytics to serve the needs of doctors and health systems. The rising technological penetration in the healthcare sector coupled with the manufacturer’s quest for producing cost-efficient, high precision, and portable devices has thus, had a profound impact on the growth of healthcare electronics industry share. With further progress in modern therapies, healthcare electronics market is also expected to witness advances in the power generation of these electronic devices from internal organs. The scientists at the University of Illinois, for instance, are conducting a research on using natural movements of the heart, diaphragms, and lungs as a power source for medical electronics devices. The current framework of technological innovations in healthcare provide significant testimony to the fact that healthcare electronics industry would thrive on state-of-the-art high-tech upgrades. With the notion of electronic equipment stimulating human heartbeats, modern-day therapies and value-based approaches have undoubtedly disrupted the traditional business models of the healthcare space. Manufacturers partaking in healthcare electronics industry share have been tapping into nanotechnology and micro electromechanical systems to fabricate devices at the molecular level. Experts predict that with the passage of time, the rising trend of introducing critical life-saving devices, such as cardioverter defibrillators & implantable pacemakers will have a commendable impact on the commercialization matrix of healthcare electronics industry. As a report by Global Market Insights, Inc., notes, worldwide healthcare electronics market size stood at around USD 60 billion in 2016. The industry analysts anticipate the emergence of home-based care, disease specific research work and customization, and convergence across health care products and industry verticals to be the key trends shaping the growth of healthcare electronics industry in the coming years. Healthcare electronics market size, as per forecasts, is certain to exceed a valuation of USD 148 billion by 2024, at a CAGR of 12% over 2017-2024.